Compact electric punch drills three 9/32" diameter holes in up to 12 sheets of 20 lb. paper in a standard configuration. Precision steel heads deliver clean punches, and paper remnants drop into the easy-to-clean chip drawer. Top-loading punch also features an adjustable paper guide for easy customization. Electric punch operates on AC power or battery power. Required six AA batteries are sold separately. Dimensions (H x W x D): 3.2" x 13.2" x 3.5"
Transcript: This is the Stanley Bostitch Electric 3 Hole Punch! First, pull this adjustable head for either 11” paper, or a3 and a4 paper. Next, insert up to 12 pages and push the button on the right. It’s quick and anyone can do it. You can choose to plug it into the wall for power with the provided plug, or you can put 6 AA batteries in for a portable hole punch. On the bottom is also the trimmings receptacle, open the tab and shake it out from time to time. And obviously I haven’t used much so not much will come out. 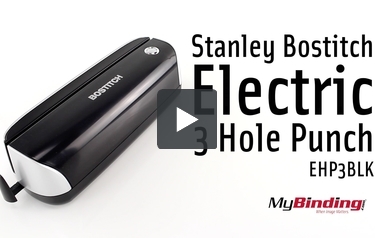 This is the Stanley Bostitch Electric 3 Hole Punch! You’re really only watching this because you need a hole punch, right? Well we sell a bunch and at prices that are hard to beat. Check this one out by clicking the big yellow button! Thank you for your question. On the Stanley Bostitch Electric 3 Hole Punch the slot the power cord plugs into is in the center on the back of the machine. The	Stanley Bostitch Electric 3 Hole Punch is also able to run off of battery power ( 6 AA batteries ).